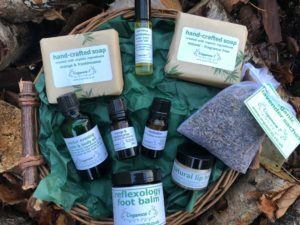 Win our 2018 Luxury Organic Christmas Hamper! Would you like to be in with a chance of winning this Luxury Organic Christmas Hamper? Worth over £50? Our New Nervous Exhaustion Pulse Point Roller Ball. 10ml. De-stress and balance. Use on the pulse points on the neck and wrist and use the gentle, but powerful effect of aromatherapy when you need it – even when you are on the go!. Two essential oil blends 10ml each – one festive, both excellent for de-stressing – Orange & Frankincense and Meditation (with frankincense, sandalwood, lavender & vetiver) 10ml of each. both are fantastic for unwinding and relaxing at the this busy time of year. Lavender Sachet – with organic lavender heads and lavender essential oil. Use in drawers/cupboards for scenting or beside your pillow to aid sleep. Reflexology Foot Balm – 60ml relax and revive your feet at the end of a busy day with the rich, moisturising blend of organic and wildcrafted oils. Also really helpful for protecting the feet from the harmful effects of winter weather. The competition closes at midnight on Wednesday 21st November , so we can get your luxury hamper to the winner, in plenty of time for Christmas. Thank you for a great service and excellent products.